Cockles are bivalve molluscs belonging to the family's Arcidae and Veneridae. 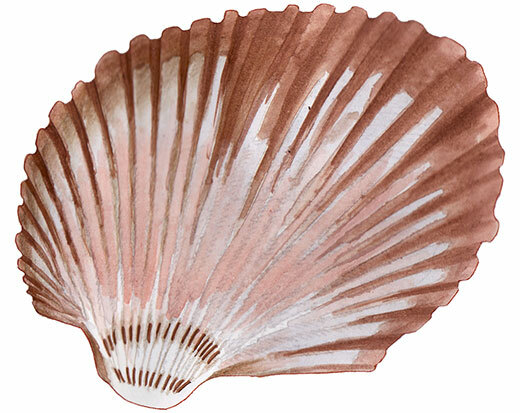 The shells (valves) are oval and oblique in shape with outward radiating ribs on the surface. They are usually white, cream or light brown in colour. The Sydney Cockle can attain a maximum diameter of 8 cm, whilst the Sand Cockle reaches 4-5 cm. Cockles are also known as Venus shells and can be found from NSW to southern Western Australia, including Tasmania. Sydney Cockle, A. trapezius, inhabits estuaries, mud flats and seagrass beds. Sand Cockle, K. scalarina, inhabits tidal flats and estuary mouths on protected or sandy subtidal sediment underlying seagrass beds to about 5 m depth. The presence of pronounced ridges makes Sand Cockles easy to distinguish from pipis, which have a smooth shell. The concentric less prominent ridges of surf clams (Dosinia sp.) distinguishes them from cockles.